A black corset top from Spin Doctor at Hell Bunny made from stretch black cotton poplin with a centre front bronze zip fastening. 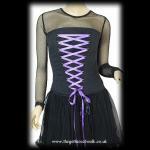 On either side of the zip is a bronze eyelet and satin ribbon corset laced panel with a further laced panel at the back. 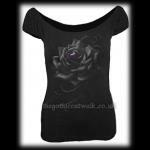 The top and bottom edges of the top are trimmed with black cotton lace and the shoulder straps are adjustable. Bust: 28" - 30" Length: 14"
Bust: 30" - 32" Length: 15"
Bust: 32" - 34" Length: 16"
Bust: 34" - 36" Length: 16"
Bust: 36" - 38" Length: 17"